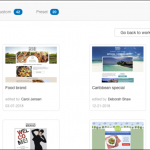 Email Designer is the new editor that, thanks to its intuitive interface, the drag & drop functionality and many other features, makes it fast and easy to create beautiful, personalized and responsive design compliant emails. Watch this video to view Email Designer in action! There’s a lot more to see, but for now you can start learning how to edit a template, change images and text, and position new content blocks as required. If you make any mistakes, you can easily correct them using the undo button. You can also preview your message at any time, to see it as it would be displayed on a desktop or a mobile screen. Ask for Email Designer to be activated on your company account and try it out for yourself.